Another great Halloween in South Pasadena, hundreds of kids, ran out of candy early. And either I’m getting taller or the trick or treaters are getting shorter. Don’t think under two feet, but close. Moms are getting slinkier, too, not that I noticed. Boas are still in. I worry about the kids running down the front steps, but it was a stunning mom in six inch heels that nearly toppled over. She caught herself, regained her composure, and it was like nothing ever happened. Slinking and styling on Halloween. Elliott Caine had picked out some crazy 20th century classical music and New Thangy free jazz vinyl to freak the trick or treaters. It blasts from the living room. Ornette getting weird. Stravinsky way out there. Some of the kids notice. That’s some weird music, Mister. They take their treat and run. Archie Shepp is really getting down now, we’re partying, handing out candy, eating pizza, freaking on some of the crazier costumes–you can always tell when mom or dad is an artist. Their kids look like an installation. Archie is screaming on a big fat tenor, a battery of African drummers generates waves of syncopation, the arrangement lays in horns like Duke Ellington. Swinging, pounding, screaming. Crazy. Trick or Treat. We toss candy in the bags. Thank you! Goblins are very polite these days. Later, candy gone, we turned out the lights, shut the door and retreated to the inner sanctum. Time to stretch. Fyl flips through a beautiful volume of Herman Leonard, the pictures of long gone jazz players are black & white and ill lit, full of shadows, smoke haunting the frame like ghosts. Miles Davis blowing behind us, cooking, Trane comes in blowing sudden rushes up and down the scale, but Miles owns the session. Elliott stops to listen to a particularly good passage. His fingers work the solo. It’s all about Miles tonight. Fifties Miles, Prestige Miles. No Lee Morgan this year. It’s the Prince of Darkness. Fyl shows us a Herman Leonard photo. Miles with trumpet, glaring. Jazz noir. Day of the Dead. Elliott starts telling us about another old jazz cat who had died, a player, can’t recall the name now, and how his son had just given him the old man’s record collection. Two big boxes full of amazing albums. We’re flipping through them and sampling some on the turntable. All kinds of great 1950’s stuff, a lot of west coast cool, and we’re digging the sounds and the wind is blowing and shivering branches tap the window. Fyl says they’re calling us. Who? The dead. The dead? The dead jazz musicians, she says. All the ones in this book. They want to come in. We laugh when an incredible trombone solo comes out of nowhere. Frank Rosolino, on cue, on Halloween. Properly sensitized, we sit in the dark, listening to the wind and the bones and telling scary Frank Rosolino stories. A jazzman Halloween. 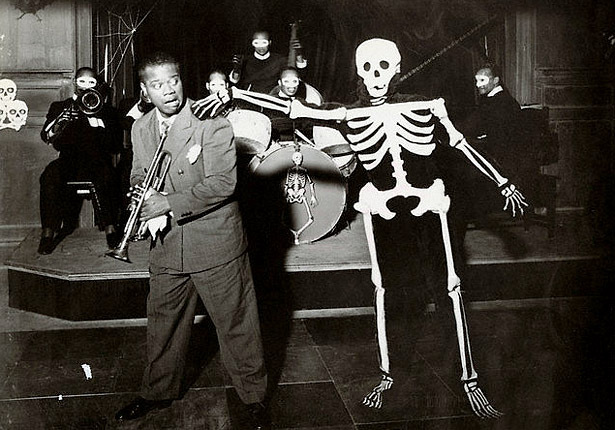 Louis Armstrong and Death itself, “Pennies from Heaven” (1935). This entry was posted in All jazz and the jazzoid, Autobiography,memoirs and confessions and tagged 20th century classical music, African drummers, Archie Shepp, Day of the Dead, Duke Ellington, Elliott Caine, Frank Rosolino, free jazz, Halloween, Herman Leonard, jazz, jazz LPs, Miles Davis, New Thing, Prince of Darkness, record collection, South Pasadena, Trane, trick or treat, trombone, vinyl, west coast cool. Bookmark the permalink.